I got a customer quilt recently that was a modern twist on an old pattern with lots of cream coloured negative space in it. 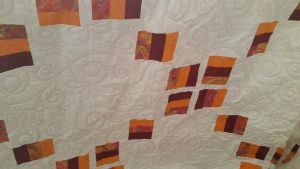 The customer had decided on a pantograph for this one and picked out a design that would suit the overall look of the quilt. When it came to picking the thread, the customer wanted a raspberry coloured thread that would look nice with the small areas of colour. 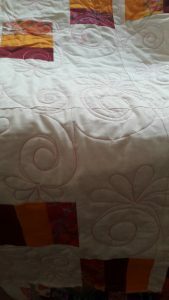 As a longarm quilter we would normally advise the customer to go for a thread that would blend well with the overall colour of the quilt and I was afraid raspberry coloured thread would look very stark on all that cream negative space. The customer said she wanted it and you have to do what the customer wants in the end. I have to say I was actually pleasantly surprised with the finished product. 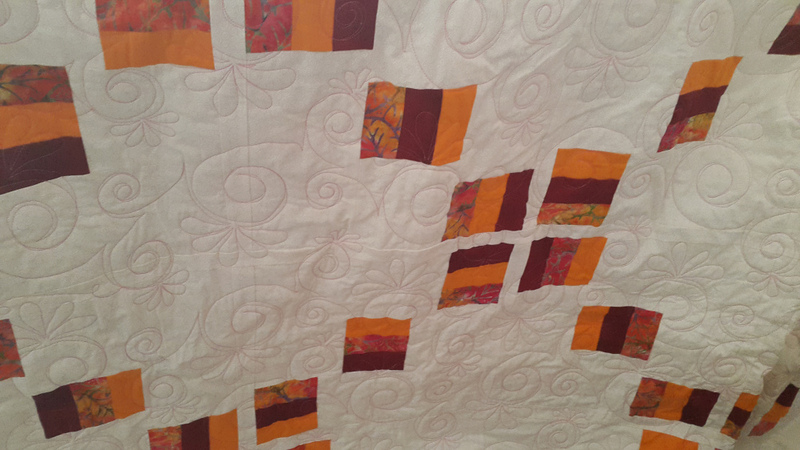 I think the thread actually added to the design of the quilt and gave it a secondary design aspect. 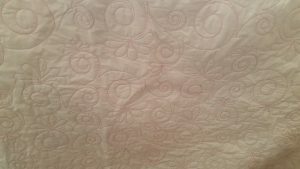 Moral of the story, you don’t always have to use a blended thread when quilting.